Since my first year at MBIS in DP1 I started participating in the co-curricular volleyball club. 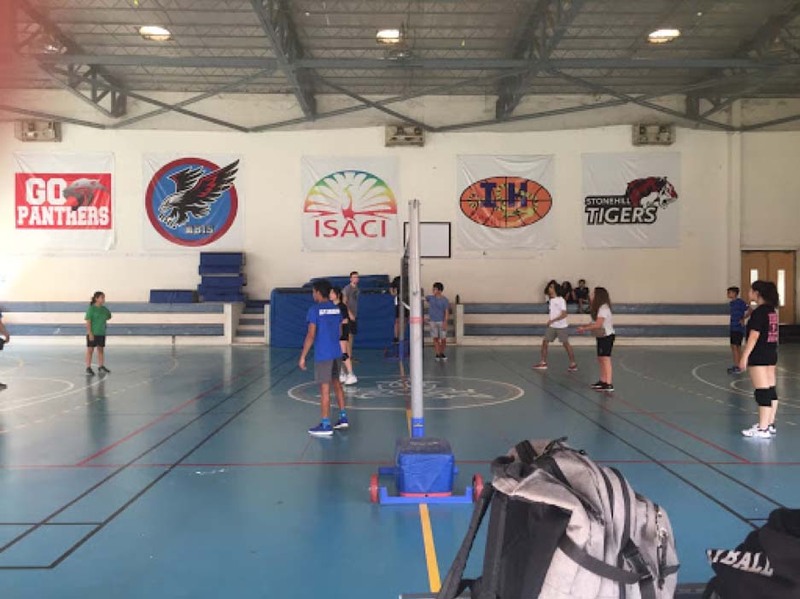 Although the girls’ volleyball (semi-competitive) ISACI team runs from December to March, I was interested in being able to play volleyball year-round. This activity is slightly different to our team practices: we only meet once a week, and it is inclusive of both boys and girls from MYP-1 until DP. This means that it is a mix of completely different skill levels, experience, and ages. Last year the activity was led mostly by our main volleyball coach, Mr. Amid, and the focus of the experience as primarily to bring us all together and enjoy the sport as leisure. As this was my second year participating in the club and fourth year playing volleyball, I decided at the beginning of the year that I wanted to take over as a coach myself, along with two other students. This became part of my CAS requirements, and over time I decided to take this further by making it my final CAS project. Thus, the transition of my role within the activity was a gradual one. When we initially started supervising this year we began focusing on learning various volleyball skill, namely, the basics, as opposed to the one hour of playing time that was allotted last year. In turn, this would allow us to play matches better when the time would come. Simultaneously, it was thought that perhaps some of the participants (especially beginners, who were numerous) had also joined the after-school as a way of learning the game and how to play. After having a brief evaluation of everybody’s experience and skill through a practice game, we started planning out the upcoming sessions: we decided to focus on a different drill each Friday. We started with bumping (receiving), setting, hitting (spiking), and eventually serving. As younger coaches, the three of us took charge of the younger (middle-school) participants, by splitting them in groups of about three and each taking charge of a group. We decided to divide the students in smaller groups so they would each have more one-on-one time with a supervisor and have more focus on them, and we chose as instructors to remain with the same subdivision of students for the continuance of the activity so as to would build a connection with our three students to aid us in teaching them. My three students were a girl and a boy from MYP-3, and a girl from MYP-2 (occasionally). All three were beginners, although some of them had participated in the volleyball CCA every so often, the previous year. They were also all around the same age, which would perhaps lead one to think that teaching them together would not be as difficult, since they were all in the same technical and age-group band. However, from the the first few practices I realised this was not the case, as each student learnt at a different pace, in different ways, and was more or less open to trying new things and putting themselves out there. The hardest part, perhaps, was being able to help them individually without they themselves feeling like they were being treated differently. As I feel like a big factor of warming the students to playing their best is creating a comfortable environment for them to learn (especially for more introvert ones), I tried to be as open and cheerful as possible. I did this by explaining myself as many times as they needed, actively seeking for questions (as they did not ask often), making sure to act in a way which would communicate that it was perfectly acceptable and positive to make mistakes (which was vital, particularly as they were all beginners), and finally, by keeping up a stream of encouragement. Although some of the students are still quite shy and more self-conscious when receiving feedback, there is a noticeable difference in their playing abilities, which is perhaps one of the most rewarding parts of the activity. This is something which which I observe after every session, and which I think is positive as it is a reliable way of measuring progress. One thing which I also decided to stress in practice was to constantly be on your toes and go for the ball (crucial in volleyball) which is more something shaped by their inclination towards being open and willing to mess up. Nonetheless, although this part of the game is taking a longer time to get used to, there is change. Our final product is a tournament in March, which the three of us planned jointly (as we would bring together the entire CCA for this). The tournament is conducted on a regular Friday afternoon and works round-robin: each team will get to play every other team with fifteen-point matches. This is a modification from regular volleyball games in order to fit our available time and amount of participants. There are three teams to be made in total. There students are divided first based on age category, and then on skill level, so that each team is a balanced mix of different technical competences, ages, and gender. The tournament was a very simple event but a nice opportunity for all of the participants to show off their skills learned in the past year. When looking at the students I have personally coached, and at all those who started in August, it was rewarding to see the change which has occurred. Looking at them during games, the progress they have been subject to became evident. In addition, it gave the activity publicity and increased the number of participants, which is a positive development as next year we need students to take over as leaders. Overall, the activity has garnered a lot of support and participants over the course of the past year, and it is something which I am looking forward to continue until the end of the year. I am especially appreciative of the way in which it enables me to combine coaching younger individuals in something I love doing (volleyball). One thing which I think can be done better is requiring better participation, as we will have members who drift in and out of the activity depending on the Friday; which is unproductive towards consistent and effective results. I also think the other supervisors and I could try to add an extension to this by switching groups at a certain point in the year, so that the students can experience different learning methods and different instructors.